A colored universal indicator MACD Classic (MA convergence-divergence indicator) that combines two indicators: MACD Line and MACD Histo. The rising and falling lines, the signal line and the indicator histogram can be colored. AD - an indicator of accumulation and distribution of volume. OBV - On Balance Volume. Volume - tick volume indicator. Force - Force Index indicator. MFI - Money Flow Index. ATR - Average True Range. RSI - Relative Strength Index. CCI - Commodity Channel Index. 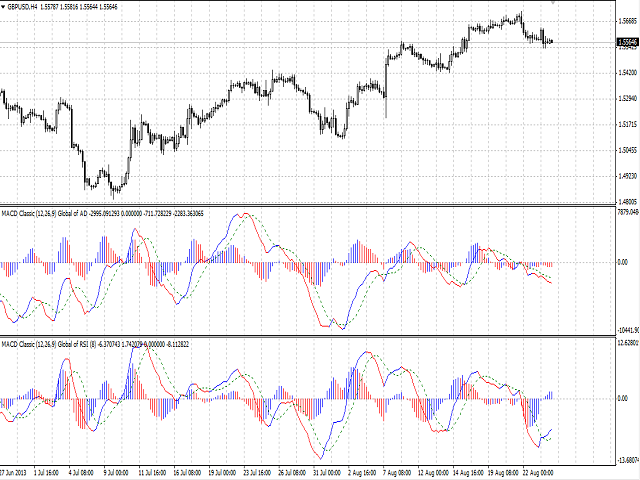 ADX - Average Directional Movement indicator. Price is used by default. The main line of the indicator - buffer 6. The signal line of the indicator - buffer 4. The bullish line of the indicator - buffer 0, must not be equal to 0. The bearish line of the indicator - buffer 1, must not be equal to zero. The main line of the histogram - buffer 7. The bullish line of the histogram - buffer 2, must not be equal to 0. The bearish line of the histogram - buffer 3, must not be equal to zero. 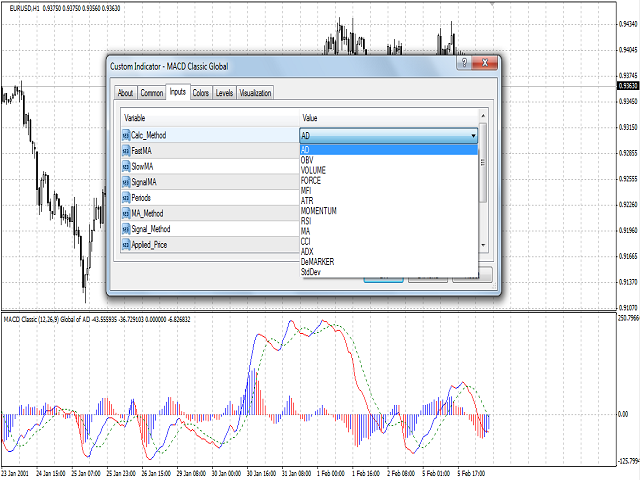 Calc_Method - the index of the indicator, based on which the MACD Line and MACD Histo will be calculated (from 0 to 12). By default, i.e. more than 12 - the standard one based on prices. 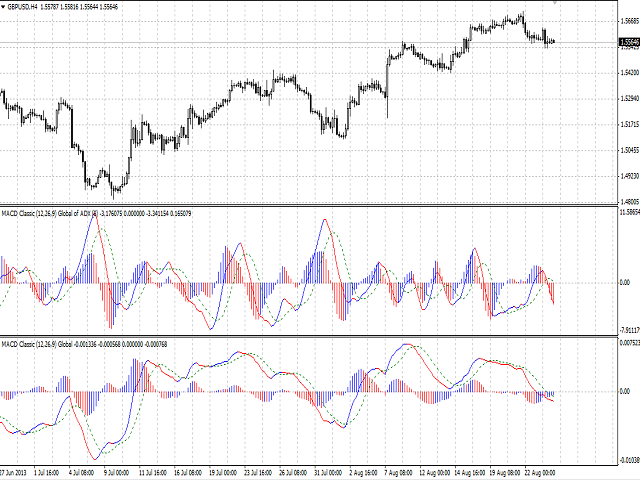 Periods - the period for calculating the basic indicator, based on which MACD Line and MACD Histo will be calculated. FastMA - the period of the fast moving average. SlowMA - the period of the slow moving average. SignalMA - the period of the signal line. 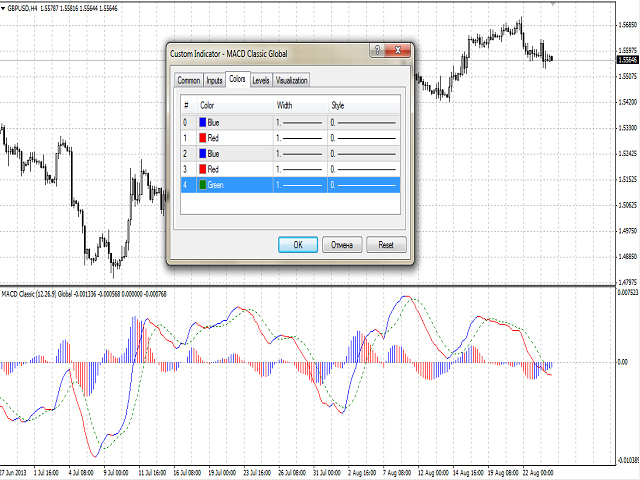 Mode - the index of the line (MAIN - 0 or SIGNAL - 1) of the basic indicator, based on which the MACD will be calculated. Shift - the sift o the basic indicator relative to the price chart. User's interface has been improved. Changed the way the lines are colored.